How to repair and replace your Dishwasher Silver Basket? Having a dishwasher is an excellent addition to any home kitchen and cooking area. We live in an age where convenience is becoming more essential as our time is better allocated around a busy life style. Many more people are working these days, more hours for less pay and less time to do all of the things that we wish we could do. Very few people have the luxury to do as they please, meaning that certain tasks in the day need minimal attention so that we may focus ourselves on being more productive as a whole. The dishwasher is an excellent tool that helps to alleviate some of these problems associated with mess and make cooking and cleaning a whole lot easier. With that in mind, part of the dishwasher use includes the stacking of plates as well as placement of utensils in a dishwasher silver basket. However, sometimes you may need to replace that Dishwasher Silver Basket as time goes on. What can affect my dishwasher Silver Basket? You may think that the Dishwasher Silver Basket may never need any form of replacement because it is not being thrown around or beaten up; it’s just sitting inside the dishwasher and holding the knives and forks which are simply being washed with water. That would be incorrect and there are more than a few ways that this basket can break. In some cases with some brand’s Dishwasher Silver Baskets, the materials that they use to create it are less than amicable for extensive use in a dishwasher. 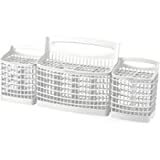 Whilst they can appear strong and firm to begin with, over time they will slowly deteriorate and parts of the plastic will warp or snap, resulting in a broken Dishwasher Silver Basket that does not hold utensils properly or clean them. It is very difficult to determine if the initial Dishwasher Silver Basket will be affect by long life wear and tear, so it may be necessary to investigate reviews on dishwashers themselves to see if they have high quality materials or just the baskets themselves. Another factor that stem into the quality of the Dishwasher Silver Basket is also the heat and intensity of the actual dishwasher itself. Some dishwashers use a minimal amount of water whilst others consume much more water and shoot it at the dishes and utensils with a much stronger force and pressure. When this is the case, it can actually erode the material faster if it is lower quality. Key Takeaway: The heat of the water can also have the same affect, causing the utensils in the Dishwasher Silver Basket to heat up to a point where it will slowly melt into the plastic of the basket or make small cuts that will eventually increase over time and cause bigger problems in the long run. Sometimes it may be simpler to just prevent the knives from facing downwards when in the dishwasher. 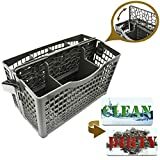 What should I look for in a new dishwasher silver basket? Finding a replacement might seem simple initially however the difference in design that can be found in each Dishwasher Silver Basket will make it difficult to find one that suits your dishwasher and will fit in properly. As previously stated, the material that is used for the Dishwasher Silver Basket should be high quality so that it will not bend, warp, melt or break when under the pressure of a dishwasher and the varying degrees of heat and intensity that it has. Reading reviews will usually give a good indicator of what you can expect of the quality and experiences of other people who have purchased similar items. It is wise to be cautious, as some might have issues with their new Dishwasher Silver Basket simply because it is not the right type for their dishwasher and they have made a mistake. The design incorporates both shape and size when considering the best replacement for a Dishwasher Silver Basket. There are multiple difference designs, some are flat, some have ridges underneath and others are designed to fit into specific shaped slots on the dishwasher shelf. It is pointless to purchase a flat Dishwasher Silver Basket when your dishwasher has ridges for plate stacking. Height is also important if you have a small or tall dishwasher, as you don’t want your utensils or basket hitting the spinning fan that propels the water jets to clean your dirty dishes. With that in mind you should consider the height when deciding on your replacement Dishwasher Silver Basket and use your old Dishwasher Silver Basket to determine a base height to follow. A cheaper and simple rectangular design, this Dishwasher Silver Basket should fit into most flat dishwashers, contains sturdy plastic and has useful compartments for easy assortment of the various silverware and utensils you place in. It also has a handle that makes it easier for you to remove it from the dishwasher. Brand new. Can be divided into 3 sections or combined into one long basket. Outer compartments have their own flip-down lid. 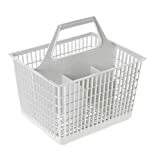 One of the more expensive options when selecting a replacement Dishwasher Silver Basket, this 19in long and 8-inch tall basket has separate compartments allowing you to expand its size. Into either 3 small baskets or one long one. Its shape and size indicate that is much more suitable for a larger sized dishwasher. Divides into 2 BASKETS or combines into 1 making it easier to fit most dishwasher models. Please see listed dimensions below or in the photos to ensure it is suitable for your dishwasher. BEST TO MEASURE YOUR DISHWASHER SPACE BEFORE PURCHASING. AMPLE SPACE with 7 compartments for your cutleries and other kitchen utensils. Comes with double sided or reversible CLEAN DIRTY INDICATOR to stop you from guessing whether your dishes have been cleaned or not. Simply flip to "CLEAN" when you start your dishwasher. Then, flip back to "DIRTY" once dishwasher is empty or loaded. BEST TO MAKE SURE YOUR APPLIANCE IS MAGNETIC. Another cheap and simple design, this Dishwasher Silver Basket is touted as a durable and inexpensive whilst also being compatible with various other models of Maytag dishwashers as well as other models in general. It does however contain a flat base, indicating that it is not the bets choice for a dishwasher that has ridges used for stacking plates and dishes. When all is said and done, it may just be easier to contact the dishwasher manufacturer and get a replacement sent from them. It may be much more expensive but could possibly be the only choice if the alternatives that you investigate are simply not appropriate for your dishwasher.